Its summer! River flows are generally below normal levels in response to low precipitation and warm air temperatures. 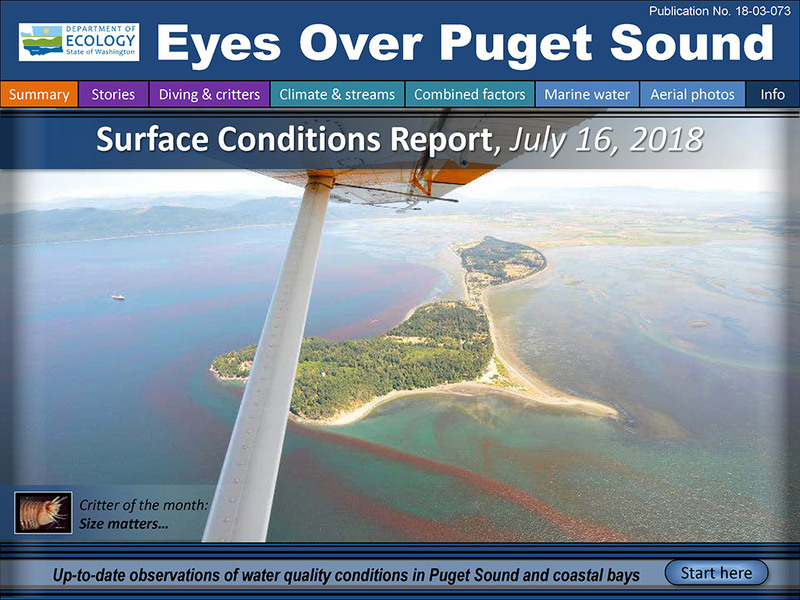 Algae blooms are causing intense red-brown colors in Bellingham and Samish Bays, as well as in some other bays. Infrared images revealed that the algal blooms are in water exceeding 15°C. These warmer waters increase the risk of harmful algal blooms if toxin-producing species are present. Large rafts of macroalgae are drifting at the surface in South and Central Sound, and are particularly extensive in Carr Inlet, Commencement Bay, and Port Madison. Our Washington Conservation Corps Intern shares her many perspectives on Puget Sound.